XE10.1 setup freezes on 22%. It tryes to extract (or download) "core64 russian" module. I can not skip this step and continue setup. Any my action loops or closes setup. I don't have an answer, only questions and suggestions. I suppose you are using the "web installer." Have you tried the offline installer? Whichever installer you have used, I would try the other one. Have you opened a support ticket or reached out through official support channels yet? Internet connection is available too. I see "core 64 russian" in the error. I will try to open ticket. Thanks. problem with my DVD-drive. I connected an external drive and it worked. But size of ISO image is over 7Gb and it is difficult to write it on physical dvd disk (4Gb). I used ordinary "daemon tools" free util for mount virtual DVD. ISO image is not seems corrupted because it was packed in ZIP file and ZIP was downloaded and extracted into ISO without errors. Possible ISO contains bad (or misses) "core64 russian" packet. There are four types of files on the setup ISO: "[somefile].7zip", "[somefile] german.7zip", "[somefile] french.7zip" and "[somefile] japanese.7zip", there are no "[somefile] russian.7zip" files at all. It looks like an attempt to install localized version while not all possible locales are supported. I've tried to switch my comp to "us-en" by installing Windows language pack. Currently I have "en-us" interface, "en-us" keyboard, US location but system remembers somehow its origin so it does not help. Setup tries to download URL above and fails. Just change HKEY_LOCAL_MACHINE\SYSTEM\CurrentControlSet\Control\Nls\Language\InstallLanguage from 0419 to 0409 before run setup. And return 0419 value back after success XE10.1 installation. XE10.1 setup freezes on 22%. version scheme stopped at 8. "There's no such thing as two." You really are a troll. No one (but you) has an issue with the name. For some reason you go out of your way to interject your rigid and unnecessary dogma about how other, free, individuals must adhere to your belief in how a product can be referred to. 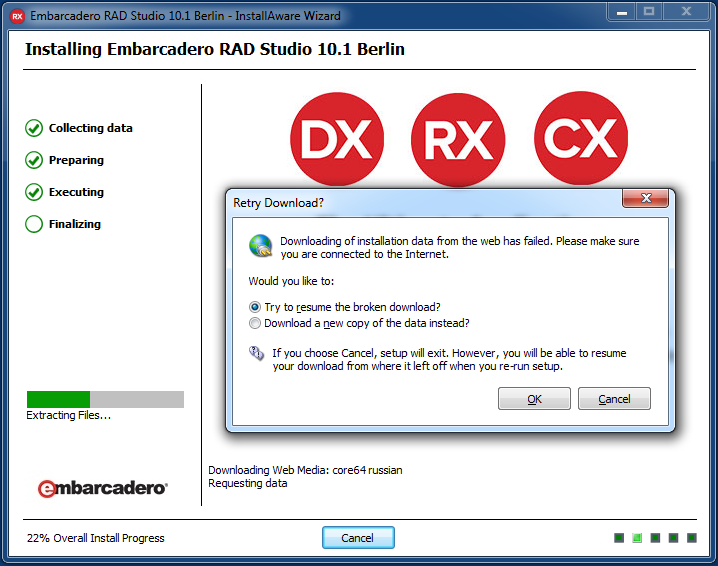 You were mistaken in saying it's rude to call Berlin XE10.1. Rude is coming into a thread with no purpose of helping to resolve a problem that people are actively engaged in a discussion about and pointing out a trivial, unrelated matter. A thread where your input was clearly not needed and your response had no bearing on resolving the issue. Grow up and get over it Rud(e)y.
Roman, glad you got XE10.1 working. You really are a troll. No one (but you) has an issue with the name. | No one (but you) has an issue with the name. newer product naming scheme. But feel free to dislike his humor. then it's obviously an installer bug. Roman, please report this. r input was clearly not needed and your response had no bearing on resolving the issue. Grow up and get over it Rud(e)y. The download link points to password protected page. I think there is no security problem. Believe me, Rudy is no troll. Check who he is and what he has done. Then check what TeamB is. the newer product naming scheme. But feel free to dislike his humor. <wiping tear out of corner of eye> Thanks. your belief in how a product can be referred to. Seattle and XE10 is also used to refer to Berlin. do, but grown up professionals should not play these silly games. will command the attention of the world."